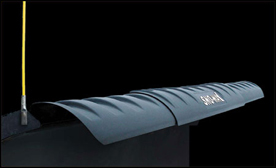 Sno-Way’s E-Z Fit snow deflector design includes enhanced curvature for optimum snow-rolling and deflection. The 3-piece design is constructed of High Molecular Weight Polyethylene (HMPE), a super-slick material with excellent impact resistance in cold temperatures. Sno-Way’s unique, molded reinforcement rib design provides superb rigidity and allows each deflector to overlap one another. The deflector will install on all Sno-Way straight blade widths from 6-feet to 10-feet. Each deflector includes stainless steel mount hardware.